Get more treatments for your money with one of our VIP memberships. Why not register today? Microdermabrasion treatments are proven to show significant benefits to the skin. Why not book today? Pedmore Beauty Rooms offer a wide range of luxurious massage treatments. Why not book today? 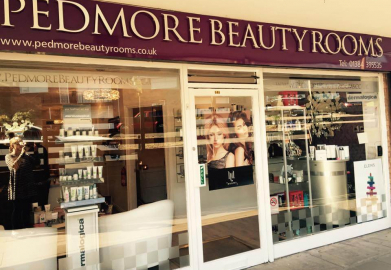 Pedmore Beauty Rooms is a luxurious beauty salon who strive to deliver first class treatments in a relaxing environment. Our salon therapists are fully trained by ELEMIS. An award winning brand! Our ambition is to provide the best and latest treatments! 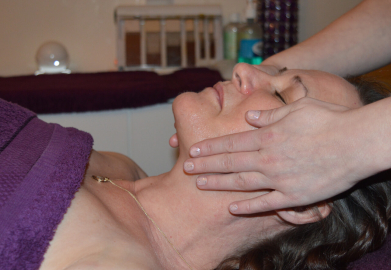 Our therapists are fully trained by ELEMIS or equivalent authority. Request appointments online via our request booking feature. Deliver Top Class Treatments In A Relaxing Environment. Below is a range of treatment categories. Click a category tab to view the list of category treatments. We offer a wide range of male grooming services. We offer a wide range of nail services. We offer a wide range of beauty services. We offer first class tanning treatments. Simply click on the image to discover the work we're proud of! Click on the treatment category tab to view the associated prices. Providing immediate results in the fight against time, this exceptional face and eye treatment helps to slow down the signs of premature ageing, reducing the appearance of fine lines and wrinkles on the face and crows feet around the eye contour. The latest research in skin preparations to effectively help reduce superficial scarring, pigmentation and fine lines and thereby resurface the skin. Pedmore Beauty Rooms are proud to offer this groundbreaking anti-ageing facial treatment. Independently tested with revolutionary results, this anti-ageing face and eye treatment instantly firms, rejuvenates and plumps up the skin whilst reducing dark circles from around the eye contour. A system of intense exfoliation. The crystals work as a gentle abrasive to remove dead skin cells layer by layer. The vacuum action of the machine stimulates the circulation and promotes increased blood flow, resulting in a firmer, smoother more youthful looking skin. The Elemis S.O.S Purifying Facial (for oily, problem and congested skins) is a powerful purifying face and eye treatment. The therapist will ask you what colour you'd like your eyebrows to be tinted. For example, brown, dark brown, black or blue-black. The therapist will ask you what colour you'd like your eyelashes to be tinted. The choices are black, blue-black and brown. After mixing the colour of choice with 2-3 drops of 2% peroxide, petroleum jelly is placed under the eyes and on the eyelid to prevent tint staining on the skin. 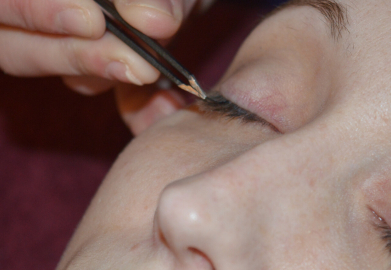 One type of lash extension is what's known as Russian lashes or the Russian Volume. This treatment requires a highly skilled technician. Using a medium-sized roller hot wax system, the therapist will apply heated wax to the groin, inner leg area and placing a wax strip on top. The hairs will be removed from their follicles by pulling back the wax strip. The therapist will ask the client what shape or look they require. 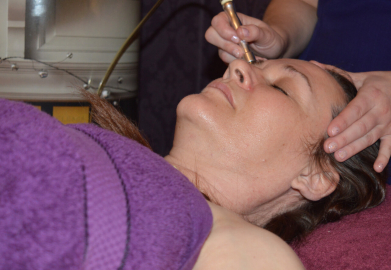 This will be followed by applying heated wax to the eyebrows by using a small hot wax roller system. Placing a wax strip on top of the applied wax will remove the hairs from their follicles once pulled back. 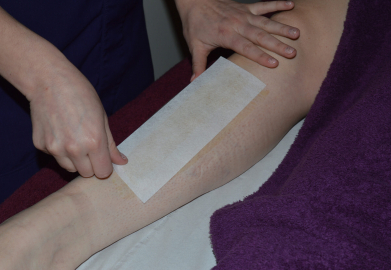 Using roller system wax, the therapist will apply heated wax on the forearm and place a wax strip on top. Pulling the strip away will remove all the hairs out from their follicles. Using a hot wax roller system, this treatment consists of waxing from the groin to the ankles. The therapist will place specialist strips on top of the applied wax and remove ther hairs from their follicles by pulling back the wax strip. The full leg wax starts from the top of the thigh, down to your ankles. The therapist will use a roller system to apply the heated wax, place a wax strip on top which will remove hairs from their follicles once pulled away. The half leg wax is from the knee down. Using roller system wax, the therapist will roll heated wax on the leg and place a wax strip on top. Pulling the strip away will remove all the hairs from their follicles. The therapist will use a small hot wax roller system to apply the wax on the upper lip. A wax strip will be applied to remove all hairs from their follicles once pulled back. The same technique will be used on the chin. The client will lie down on the treatment bed and raise their arm whilst resting it behind their head. The therapist will use a hot wax roller system to roll heated wax on the underarm hair and place a wax strip on top of the applied wax. There are currently no treatments in the "Male Grooming" category. The Deluxe Manicure includes a file, shape, cuticle work, hand scrub, hand mask with heated hand mitts and moisturise. During the Express Manicure treatment, the therapist will file the nails to a shape the clients requires whilst removing any unwanted cuticles. This manicure is a lovely treat to the hands. With this treatment, you'll have the nails filed, cuticles removed, hands exfoliated and a lovely hot paraffin wax which opens the pores of the skin. This massage focuses a full 25 minutes on your back, neck and shoulders which will loosen any tension you may have. This treatment is a deep pressure back massage. The therapist will work on the back muscle tension for a full 30 minutes. A firm pressure massage that focuses on muscle tension to relieve stress and knotted areas. A nice relaxing massage that relieves stress, rebalances and revitalises. This massage is perfect to improve circulation, flexibility and relaxation using pre-blended oils. This 60-minute full massage that focuses on knotted areas using volcanic rocks. The hot stone full body massage is great for releasing tension. The mother to be massage combines multiple massage techniques which are tried, tested and safe for pregnant women. Acrylic nail extensions have been a popular treatment at Pedmore Beauty Rooms for many years. Our therapist will provide a first class service and will never use an electric drill as we firmly believe this will damage the nail bed. The therapist will file the nail into a shape of your choice, remove all the cuticles and prepare the nail bed by buffing and priming. You'll be able to choose an O.P.I polish from our wide selection, which the therapist will apply to your nails. The therapist will file the nail into a shape of your choice. You'll be able to choose an O.P.I polish from our wide selection, which the therapist will apply to your nails. The therapist will file the nails or cut them short. 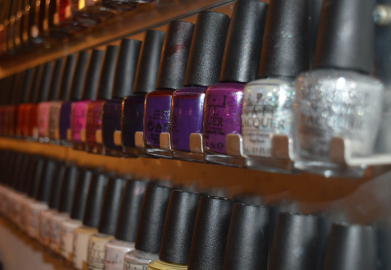 You'll be able to choose an O.P.I polish from our wide selection, which the therapist will apply to your nails. There are currently no treatments in the "Other Services" category. The Deluxe Pedicure is designed for feet that need that extra bit of attention. The therapist will file the nails or cut them short, followed by removing all the cuticles and prepare the nail bed by buffing and priming. This pedicure treatment contains cuticle removal, foot scrub, foot soak, heated foot booties, hard skin buff and removal, foot and leg massage and to finish off with toenail shape and paint. This pedicure is a quick 30-minute treatment. The therapist will file the nails or cut them short, followed by removing all the cuticles and prepare the nail bed by buffing and priming. 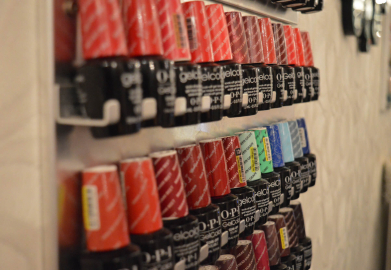 You'll be able to choose an O.P.I polish from our wide selection, which the therapist will apply to your nails. This facial treatment is for skin in need of a super saturating moisture boost. For a powerful recharge, this facial will bring back the glow of tired and lifeless complexions. This facial treatment is for restoring skin balance and to help heal and repair oily, problematic and congested skin. There are currently no treatments in the "Specialist Treatments" category. The therapist will use sienna spray tan with options from 8% to 12% depending on the tan requirements. Pedmore Beauty Rooms provide a 1-hour sienna which develops within the hour, therefore you can wash off after. The therapist can spray the full body, front and back and a half body option is also available. Decongests and stimulates the body’s systems. Excellent for improving the dimpled appearance of cellulite and reducing fluid retention. A ceremony of pure sensuality to tantalise and delight! A traditional Balinese recipe of Coconut, Mungbean, Spices and Lavender is combined with Exotic Frangipani Monoi Moisture Melt to polish the skin and stimulate the senses. This nourishing body wrap drenches the skin with moisture for immediate softness, providing the ultimate radiance, vitality and all over body glow. Detoxifying Fennel and Birch body mask are applied to the hips and thighs, which is then followed by a specialised drainage massage to smooth the appearance of cellulite, boost the blood circulation and reduce fluid retention, leaving your skin firmer and smoother to touch. This seaweed wrap treatment detoxifies and deep cleanse the body inside and out along with easing the pains of rheumatism, arthritis, muscle spasm and fatigue.